One of the pleasures of the constant stream of wonderful art that is being added to the Look and Learn children’s art gallery is being able to compare the work of young artists with that of the professional artists who worked for Look and Learn during the 1960s and 1970s. In many cases – particularly when it comes to figure painting – the Look and Learn artists clearly win out. But sometimes the children’s art in astonishing in a way the professional’s art cannot match. Take this picture of the sun by Thaanu Akilesha. The theme of March’s children’s art competition is “Tree house”, and the closing date is 7 April 2008. £240 (approximately US$480) of cash prizes will be awarded to the best three competition entries in each age group (0-7, 8-11, and 12-18): 1st prize £35, 2nd prize £25, third prize £20. Winners will also receive a beautiful printed certificate in the post. 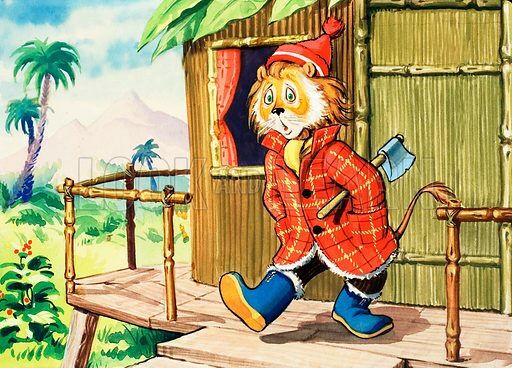 This is a picture of some puzzled-looking Leo the Friendly Lion which appeared in Playhour, probably in the 1960s.